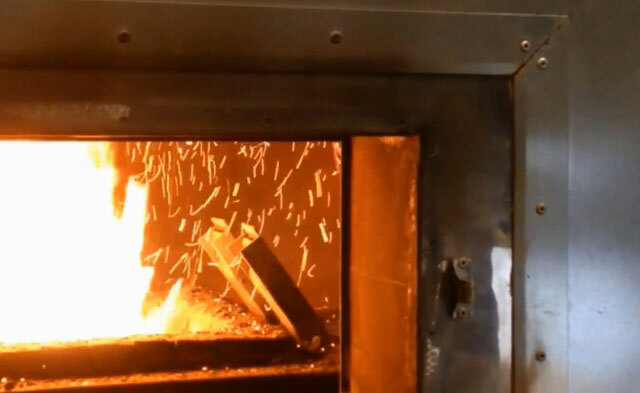 Viking Company of Albany, MN, along with partners Clean Energy Resource Teams and the Agricultural Utilization Research Institute, are pleased to announce the findings of the Advantages of Wood Heat for Poultry (PDF) field study. Results and future use: This project provided detailed insight into the use of wood heat to meet the thermal needs of poultry production. 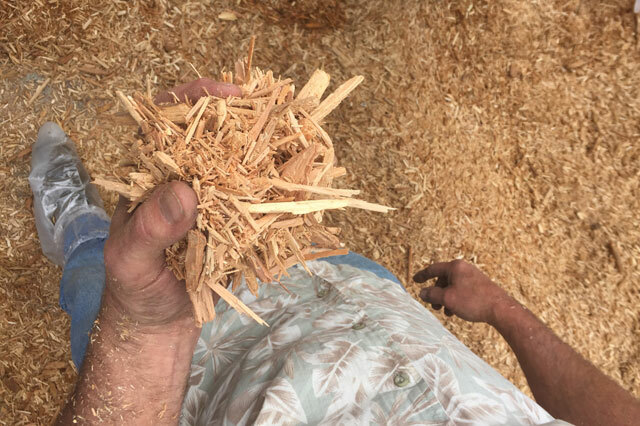 The data collected demonstrates woody biomass is a viable, cost-effective fuel for producers looking for alternatives to liquid propane. According to Koenig, Pilgrim’s (home of Gold’n Plump and Just BARE brand chicken) continues to show interest in biomass heat exchange as a desirable choice of poultry house heat and Pilgrim’s is in discussions with Viking Company to develop ways to provide support and collectively benefit from the outcomes. 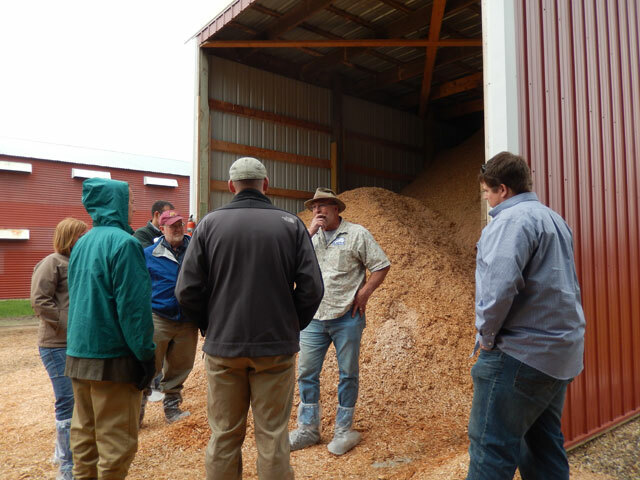 Farm tour and presentations: On May 19, 2017, the Clean Energy Resource Teams (CERTs) and AURI (Agricultural Utilization Research Institute) hosted a group of 30 at Hillcrest Restaurant in Albany, MN to hear presentations on commercial biomass heating and then headed out to the nearby Viking Company farm for a demonstration tour of their biomass-heated poultry barn. Click here for overview and presentations. For more information about the project and technology applications: Contact Fritz Ebinger, Program Manager for Rural Energy Development with the Clean Energy Resource Teams (CERTs) at University of Minnesota Extension’s Regional Sustainable Development Partnerships at 612-626-1028. Click here to download the final report. You can also download a press release about the project. Viking Company: Viking Company is a broiler chicken growing operation in Albany, MN. It is a limited partnership family farm, owned and operated by managing partner Bill Koenig and his family. Mr. Koenig has been raising broiler chickens for over 36 years, primarily as a contract grower for the Gold’n Plump and Just BARE brands owned by Pilgrim’s. Clean Energy Resource Teams (CERTs): The Clean Energy Resource Teams are a statewide partnership with a shared mission to connect individuals and their communities to the resources they need to identify and implement community-based clean energy projects. CERTs partners include University of Minnesota Extension Regional Sustainable Development Partnerships, Great Plains Institute, Southwest Regional Development Commission, and the Minnesota Department of Commerce, Division of Energy Resources. Agricultural Utilization Research Institute (AURI): The Minnesota Legislature created the Agricultural Utilization Research Institute to generate economic impact in Minnesota by helping develop new uses for agricultural products through science and technology. AURI accomplishes this by helping businesses take advantage of innovative opportunities in four focus areas: biobased products, renewable energy, coproducts and food. AURI’s mission is to foster long-term economic benefit for Minnesota through value-added agricultural products. Becker Fireplace Center (dba EvenTemp Biomass): Becker Fireplace in Becker, MN was the vendor for that project. Select photos with captions below. To download full-resolution photos and find more images, visit the Flickr album. Viking Company owner Bill Koenig of Albany, MN shows tour participants the wood fuel storage bunker containing two types of fuel used in the biomass heating system for one of his broiler chicken barns. 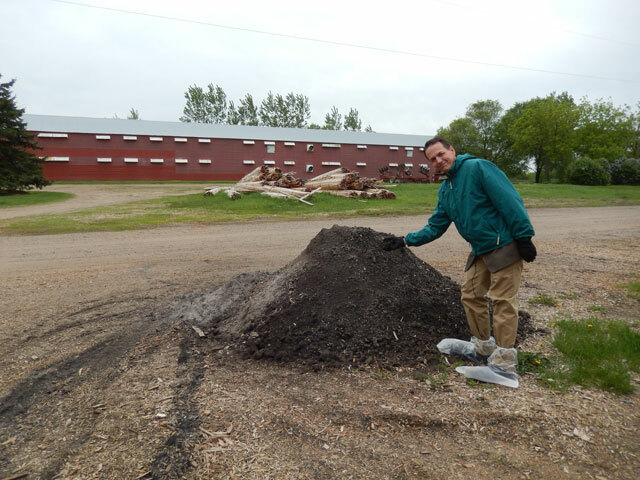 Viking Company owner Bill Koenig of Albany, MN with a handfull of wood chips that will soon be used to heat one of his broiler chicken barns. 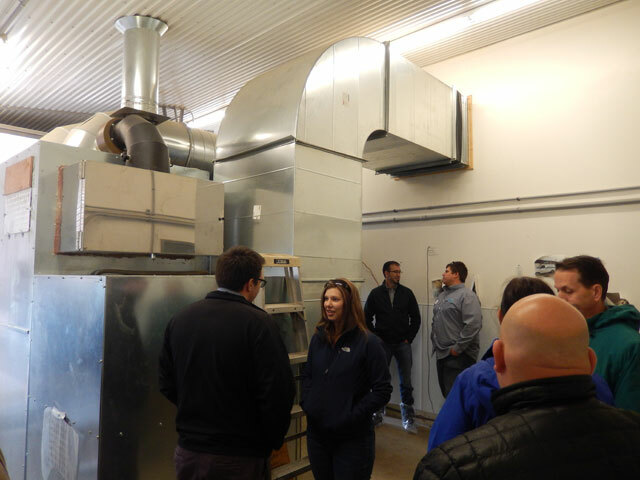 Tour participants take a close look at the biomass furnace heating a barn at Viking Company, a broiler chicken growing operation in Albany, MN. A peek into the biomass furnace at broiler chicken operation Viking Company in Albany, MN during a recent tour. This photo shows the relatively small pile of ash resulting from burning seven semi-truck loads of biomass in the furnace at Viking Company in Albany, MN.